Earn up to 2,875 reward points. Serious overdrive tone and stage-ready power from a head that fits on your pedalboard. The Quilter Overdrive 200 is inspired by legendary and almost unobtainable amplifiers, bringing an iconic overdrive sound within reach of the average musician. 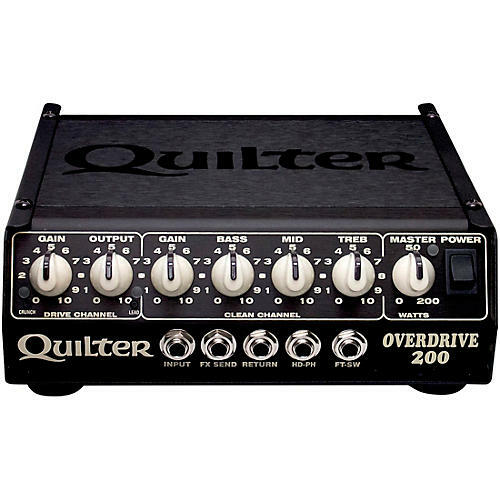 The dynamic 200 watt Quilter Tone Block power section is combined with a traditional “Tone Stack” EQ section to form a classic clean channel, along with multiple switchable drive sections, providing several explosive overdriven tones. The big brother to the Quilter 101 Reverb. “Tone Stack” EQ section married with an active Mid control for a wide range of high headroom clean tone. A preset Mid Scoop is engaged for a tight mid-gain tone. EQ controls are defeated and the drive channel’s gain and output are activated so desired saturation and volume balance can be easily achieved. The lead channel shares the EQ setting with the clean channel so to not have a dramatic shift in tone between voicings. The gain structure is based on rare and collectable early cascading gain stage amplifiers. The gain and output controls also become active and is balanced with crunch channel. Engaging both the Lead and Crunch channel delivers the high-gain tone of the lead channel and removes the EQ from the circuit for an unrefined heavy tone. The Overdrive 200 accepts a standard two-position footswitch, with or without LEDs. In the interest of saving you money, the Quilter engineers passed on manufacturing a bespoke footswitch and designed the Overdrive 200 to accept any other one. Quilter also included an adhesive label with every Overdrive 200 so that you can label your own.